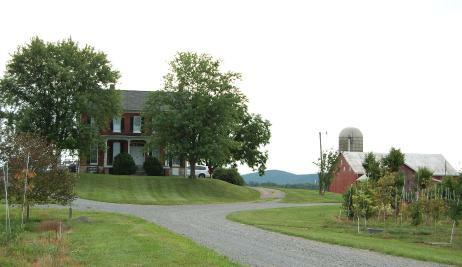 Raemelton Farm began operations in the summer of 2004. Evaluation of nearly a hundred potential locations over a two year period yielded one clear choice. 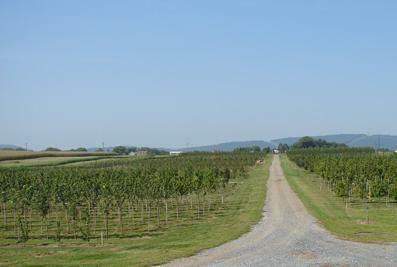 The nursery sits on 185 acres of prime farmland in the Monocacy River valley south of Frederick Maryland. 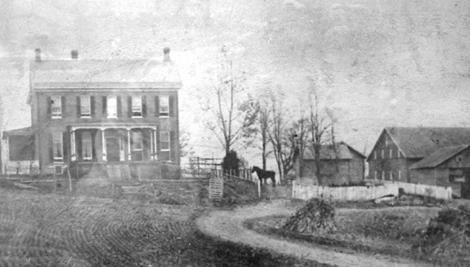 The ground has been in agricultural production since the 1700s and was once owned by Charles Carroll, a signatory to the Declaration of Independence. 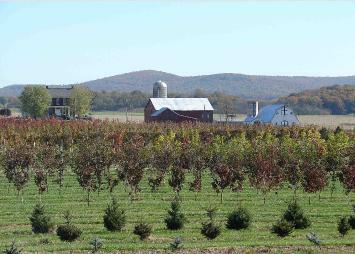 An intensive year of clean-up, repair, and conversion transitioned the farm to production of B&B trees. The high quality soil needed little help just a slight adjustment of the nutrient levels and some sub-soiling. The first trees were planted in March 2005. Field 1 (we were too tired to be more creative) encompasses 6.5 acres and holds more than 2,700 trees of 87 different cultivars. We learned a great deal from our first planting. Field 2 (again with the creativity) had its infrastructure installed the fall before planting. Irrigation lines and valves, sod aisles, and deer exclusion fencing were in place by December 2005. By the summer of 2006 Fields 1 and 2 were both on-line. The trees, despite a string of 100 degree + days were happily pushing new growth--thanks to cool root zones and steady moisture provided by the drip irrigation system. The deer fence was expanded to the outer perimeter of the production area. The above left photo shows the main entry into the farm, Field 2 is on the left. 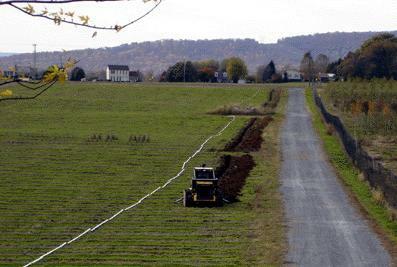 The irrigation line for this field was installed the fall before planting occured. You can see the temporary deer fence along Field 1; each year we add another field and modify the fence so all of our trees are protected from destruction by the many deer herds in our area. 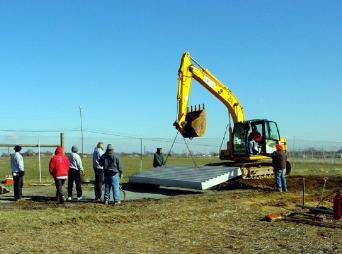 The cattle grate was installed shortly after Field 1, no use in having a deer fence with a gaping hole in it! This takes the place of the need for and electronic gate and only a few brave deer have traversed it so far. We spend almost no labor hours on deer control, but I think the crews secretly like the occasional deer-rodeo to drive one out the back gate! We now have 8 fields in production and will be expanding to field 9 in spring/fall of 2018. Initially I was really excited for the farm to 'get bigger' every year but now we're turning rows in existing fields since most of the first plantings have been dug and sold. Go to the 'Sustainability' page and you'll see how we turn our rows! We use the land as efficiently and sustainably as possible; no planting in the same tree row every rotation, and we replenish all lost soil from digging. Click here to see some of the cool places our trees have been planted! Click the logo above to visit our ORGANIC page!